There were two types of American soldiers during the Revolution. The Continental Army was similar to our army today. It was established by the new American government and made up of soldiers from all thirteen colonies. 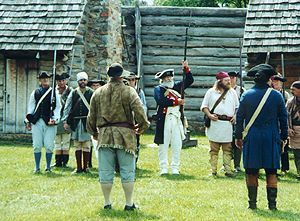 These soldiers wore blue and white uniforms - see the two men in blue coats at the right - and they fought under the command of Continental officers. There were also many local militia units. 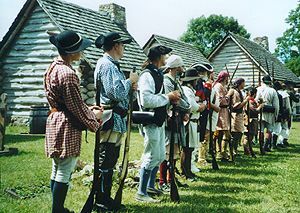 These were small, locally organized groups of men who fought together, often to protect their own farms or settlements. These men wore whatever they could bring along. They fought in the same way they hunted for food, using quiet and surprise to help catch their enemies.